This is one of the quickest cards that I have made in a while, and I really like the results. Sometimes simple is better, you know? 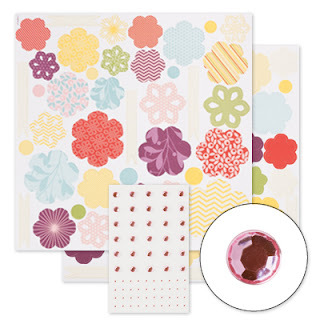 The secret ingredient is the Blossom Builders Kit, which is offered in the Stampin' Up! Occasions Mini Catalog. The double sided die cuts blossoms are pre-printed so all you need to do is punch them out. 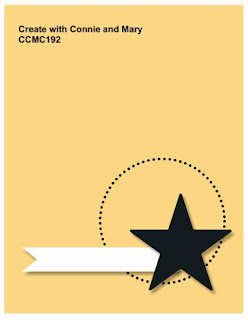 This fabulous, simple layout is courtesy of the Create With Connie and Mary Sketch Challenge. I was not the only one who thought the Blossom Builders would be perfect for this challenge. Click on the link to check out all the other creations using this sketch. I curled the edges of the blossoms just a bit with the side of my bone folder to give them some dimension. The background was embossed with the Stripes Embossing Folder to add some interest. 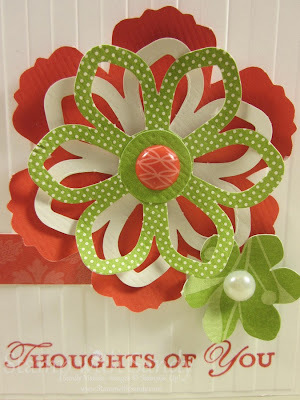 A Large Pearl and a brad from the Everyday Enchantment Ribbon and Brad Pack are the perfect centers for the blossoms. The Blossom Builder Kit, Loving Thoughts Stamp Set and Large Pearls are offered for a limited time in the Stampin' Up! Occasions Mini Catalog. Click here to request a free copy of the catalog or click here to view the catalog online now. Please leave a comment! Thanks! Such a pretty card! I love the bright cheerful colors. The white on white background looks fantastic behind the flower. Gotta love those flowers. Thanks for joining us this week over at Create with Connie and Mary. Beautiful card! And so clean and simple, too! Love the colors and details! Thanks for playing the challenge at Create with Connie and Mary! Gorgeous--love all the white space. The embossed stripes on white look like beadboard--the perfect backdrop for that gorgeous layered flower. Thank you for playing along with us at CCMC! Super cut Clean & Simple card. The flower layers are absolutely gorgeous! Thanks for participating with Create with Connie & Mary this week! Oh this is just simply stunning! I love how that flower just pops against the white! Thanks for playing along this week in the Create with Connie and Mary Thursday Challenge! This is so pretty! Love the colors you chose...so vibrant! I love the textures, too. Very bright and cheerful! This would brighten anyone's day! Thanks for playing the Create with Connie & Mary challenge this week! 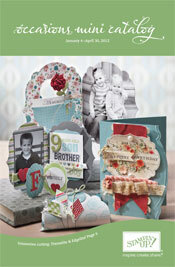 LOVE that kit and your card is CAS elegance! Beautiful! Thanks for playing along with the sketch challenge this week on Create with Connie and Mary!